Go to original pattern for design DROPS 201-32. 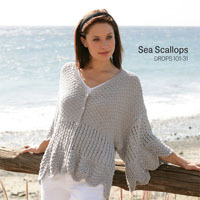 Knitted long jumper with round yoke in 2 strands DROPS Sky. The piece is worked top down with lace pattern. Sizes S - XXXL. 12 stitches in width and 17 rows in height with stocking stitch and 2 strands = 10 x 10 cm. DROPS DOUBLE POINTED NEEDLES SIZE 9 MM. DROPS CIRCULAR NEEDLE SIZE 9 MM: length 40 cm and 80 cm. DROPS DOUBLE POINTED NEEDLES SIZE 8 MM: for rib. DROPS CIRCULAR NEEDLE SIZE 8 MM: length 40 and 80 cm for rib. See diagram A.1. Choose diagram for your size. To work out how to increase evenly, count the total number of stitches on needle (e.g. 56 stitches) and divide by number of increases to be made (e.g. 14) = 4. 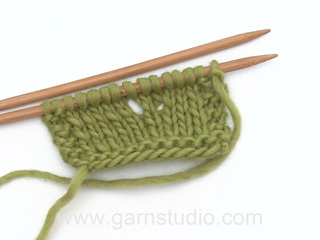 In this example, increase by making 1 yarn over after each 4th stitch. 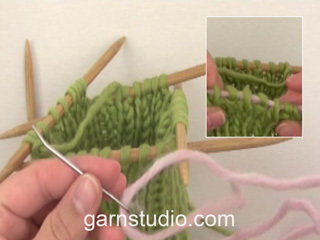 On the next round knit the yarn overs twisted to avoid holes. Work until there are 2 stitches left before marker thread, 1 yarn over, knit 4 (marker thread sits in the middle of these 4 stitches), 1 yarn over. On the next round, knit the yarn overs twisted to avoid holes. Then work the new stitches in stocking stitch. 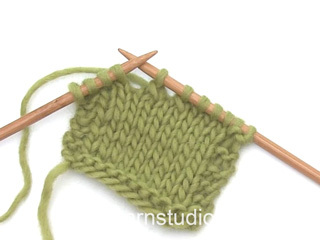 Decrease 1 stitch on each side of marker thread as follows: Work until there are 3 stitches left before marker thread, knit 2 together, knit 2 (marker thread sits between these 2 stitches), slip 1 stitch as if to knit, knit 1 and pass the slipped stitch over the knitted stitch. The piece is worked in the round with circular needle, top down. 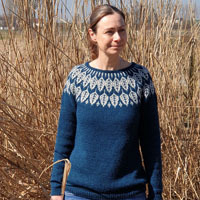 Sleeves are worked in the round with short circular needle/double pointed needles, top down. Cast on 56-56-60-60-64-64 stitches with circular needle size 8 mm and 2 strands Sky. 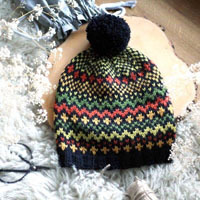 Knit 1 round. Then work rib (knit 2, purl 2) for 3 cm. Arrow-1: Increase 14-14-16-16-16-18 stitches evenly spaced – read INCREASE TIP-1 = 70-70-76-76-80-82 stitches. REMEMBER THE KNITTING TENSION! Arrow-2: Increase 26-28-30-30-30-32 stitches evenly spaced = 96-98-106-106-110-114 stitches. Arrow-3: Increase 24-28-30-30-30-32 stitches evenly spaced = 120-126-136-136-140-146 stitches. Arrow-4: Increase 24-30-30-30-30-32 stitches evenly spaced = 144-156-166-166-170-178 stitches. Arrow-5: Increase 22-30-32 stitches evenly spaced = 188-200-210 stitches. 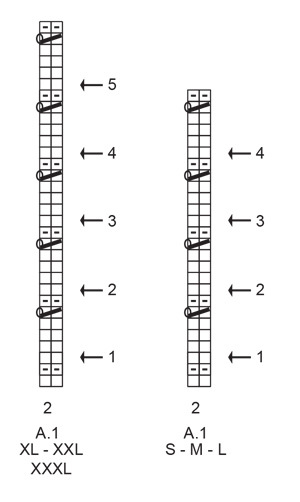 When A.1 has been completed in height, the piece measures approx. 18-18-18-22-22-22 cm from the cast-on edge. Continue in the round with stocking stitch. When the piece measures 19-20-22-24-26-28 cm, increase 26-32-34-22-30-34 stitches evenly spaced = 170-188-200-210-230-244 stitches. Continue working until the piece measures 21-23-25-27-29-31 cm. 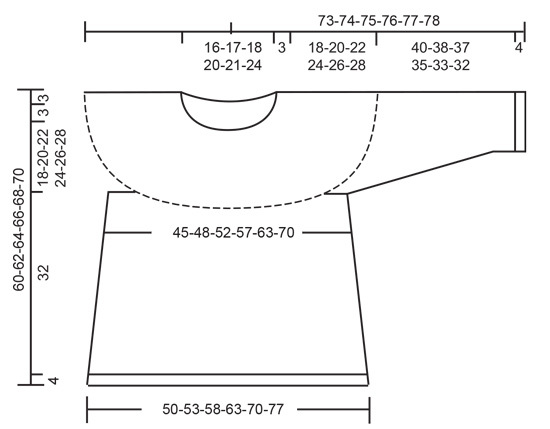 The next round is worked as follows: Work the first 24-26-28-30-34-37 stitches (= half back piece), place the next 37-42-44-45-47-48 stitches on a thread (= sleeve) and cast on 6-6-6-8-8-10 new stitches on needle (= in side under sleeve), work the next 48-52-56-60-68-74 stitches (= front piece), place the next 37-42-44-45-47-48 stitches on a thread (= sleeve) and cast on 6-6-6-8-8-10 new stitches on needle (= in side under sleeve) and work the remaining 24-26-28-30-34-37 stitches (= half back piece). THE PIECE IS NOW MEASURED FROM HERE! = 108-116-124-136-152-168 stitches. Insert a marker thread in the middle of the 6-6-6-8-8-10 stitches cast on under each sleeve. Allow the threads to follow your work onwards. Continue in the round with stocking stitch. When the piece measures 4 cm increase 1 stitch on each side of both marker threads – read INCREASE TIP-2. Increase like this every 12-12-8-8-8-8 cm a total of 3-3-4-4-4-4 times = 120-128-140-152-168-184 stitches. When the piece measures 32 cm increase 24-28-28-32-36-36 stitches evenly spaced = 144-156-168-184-204-220 stitches. Change to circular needle size 8 mm and work rib (knit 2, purl 2) for 4 cm. Cast off with knit over knit and purl over purl. Make sure the cast-off edge is not tight; increase a needle size when casting off if this is a problem. The jumper measures approx. 60-62-64-66-68-70 cm from the shoulder down. Size S: Decrease alternately every 4 cm and 5 cm a total of 8 times. Size M: Decrease every 3 cm a total of 10 times. Size L: Decrease every 3 cm a total of 10 times. Size XL: Decrease alternately every 2 cm and 3 cm a total of 11 times. Size XXL: Decrease alternately every 2 cm and 3 cm a total of 11 times. Size XXXL: Decrease every 2 cm a total of 12 times. When all the decreases are finished there are 27-28-30-31-33-34 stitches on the round. Continue with stocking stitch until the sleeve measures 40-38-37-35-33-32 cm (shorter measurements in larger sizes due to wider neck and longer yoke). Now increase 5-4-6-5-7-6 stitches evenly spaced = 32-32-36-36-40-40 stitches. 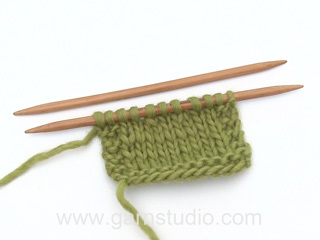 Change to double pointed needles size 8 mm and work rib (knit 2, purl 2) for 4 cm. Cast off with knit over knit and purl over purl. Make sure the cast-off edge is not tight; increase a needle size when casting off if this is a problem. The sleeve measures approx. 44-42-41-39-37-36 cm. Work the other sleeve in the same way. Wenn ich die Anleitung richtig verstanden habe, ist der Halsausschnitt vorne und am Rücken gleich hoch, oder? Die Zunahmen an der Passe sind genial gelöst! Liebe Vroni, ja genau man strickt hier keine Erhöhung hinten am Hals so wird der Halsausschnitt hier vorne und am Rücken gleich hoch. Viel Spaß beim stricken! Buongiorno a voi e grazie per la precedente risposta. Purtroppo non ho rivenditori Drops vicini e quindi acquisterò il filato online. Ho deciso di utilizzare il Belle, ho una mano abbastanza regolare, potete dirmi approssimativamente quanto ne occorre per la misura XXXL? Grazie! Buongiorno Emilia. Alla seguente pagina, trova le indicazioni per sostituire la quantità di un filato con altre qualità. Per ogni dubbio, chiarimento e consiglio, può rivolgersi al suo rivenditore Drops anche via mail o telefono. Buon lavoro! Salve! Vorrei eseguire il lavoro con un filato più primaverile, è possibile? Quale potrebbe essere il filato adatto? Il convertitore non mi ha dato alternative... spero in voi! Grazie! Buonasera Emilia. Filati più leggeri del gruppo B, possono essere: Belle, Muskat, Cotton Light, Cotton Merino, usati doppi. Verifichi sempre che il suo campione corrisponda a quello indicato nel modello. Per ulteriori consigli e aiuti, può rivolgersi al suo rivenditore Drops di fiducia. Buon lavoro! Moc se mi líbí, chtěla bych si ho udělat. Très joli le motif en arrondi sur le buste et les épaules. Nydelig. Fin til både bukse og skjørt.